Over the past few weeks, I added a few more single stitch flowers to Hope. The first one to be added were the roses. Here they are, stem stitch roses with Oyster stitch buds. Once the roses were added, there were a few small spaces left. I opted for french knot flowers in random colors , unlike other flower bunches where the color combo was kept intact throughout. There are still spaces left, but I just cannot bring myself to fill in - if I do that,I fear that the tiny flowers may get lost in the crowd. So, in a sense I guess this is not pure negative space embroidery. All negative space embroidery that I've seen in google-land involves complete filling up of the empty space outside the pattern. May be I'll give the concept a try again with a smaller design. Here are some more pics..
You can click on the pics for a better view. If you've landed late on this page and would like to see how this project progressed, here are the links to the previous posts.. 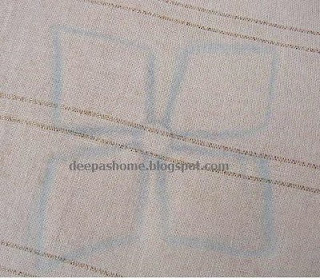 The entire embroidery is stitched up with stranded cotton. When we were told of the move to Germany, in-spite of all the apprehensions, there was one thing about which I was happy about - that I would get to use some of those yum crewel wool, perle cottons which we never get in India.With that thought I brought along with me only a very limited set of threads. But now I've realized that the grass always appears green on the other side.Erlangen is one of the worst places that a person with embroidery as a hobby could land.There's nothing else but wool in the stores and the handful of threads, if at all there, are absurdly expensive. I've decided to use whatever I have with me here for the time being. Only desperation can drive me to buy the threads from here. Talking about stranded cotton, I would like you to see a wonderful piece of stumpwork violets by Rachel at her website. Shows that one doesn't need fancy threads for embroidery. Yeah, I know, I am trying to pacify myself [smile] . But, yes, her work is awesome. I hope you enjoyed looking at "Hope" :) Now I've to think of something else . Flowers again...hmm,not sure. Good bye till I think up of something else.. Thank you! I love using exotic threads, but it's good to be reminded of how much you can do with simpler ones! I think, as Goldilocks would say, this is just right! I think adding any more to the background would be likely too much. This way it looks airy and the flowers stand out just enough to see the details. I like this!! This is stunning! I'm so glad you didn't fill the background-- this makes the letters pop.Lovely stitching. Absolutely perfect, well done Deepa! I love this piece. I can't imagine living somewhere that you can't get the supplies you need. Shipping costs are usually prohibitive, but not being able to see and feel is the worst. This is really pretty and I know it wasn't easy, but you make it look easy to do the negative space embroidery. I like that you outlined the letters in back stitch as a guide. Looks perfect ! Congratulations on the finish Deepa! another exquisite piece. congratulations on a work finished! Beautiful flowers Deepa, a lovely finish! Such a disappointment for you, not being able to find a choice of threads! Like Margaret, I have found it impossible to buy Perlè threads in our English sewing shops now. I don't see why that should be. I know a lot of cross stitchers would generally be buying stranded threads, but I would have thought the ladies of, for example, the Embroiderers Guild would be more likely to use Perlè for their projects, and I would have imagined that would mean plenty of customers for Perlè threads in the shops, but maybe too many of us are purchasing our threads online these days? Unfortunately buying online seems to be the way to go! Could the local wool be suitable for crewel work perhaps?